As Performed by Gordon Goodwin's Little Phat Band. Composed by Gordon Goodwin. Jazz Ensemble; Performance Music Ensemble; Single Titles; SmartMusic. 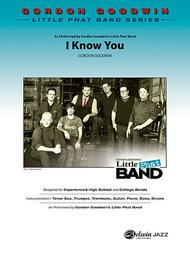 Gordon Goodwin Little Phat Band Series. Jazz. Score. 12 pages. Alfred Music #00-40391S. Published by Alfred Music (AP.40391S). As performed by Gordon Goodwin's Little Phat Band, the instrumentation is tenor sax, trumpet, trombone, piano, guitar, bass (acoustic), and drums. A delightful medium swing with nice chord changes and solo space for all. A very playable combo chart. (3:02) This title is available in SmartMusic.